Wendelin Van Draanen visits with the next and final installment of her Edgar Allan Poe Award-winning Sammy Keyes teen mystery series. Joining her is Mark Huntley Parsons, who presents his debut young adult novel, Road Rash, about a teenage drummer who finds out what life is really like on tour with a rock band. In Sammy Keyes and the Kiss Goodbye, Sammy doesn’t go looking for trouble, but she seems to find it everywhere. She’s forever sniffing out clues and chasing down bad guys—and driving her friends a little nuts. She’s gone up against thieves and counterfeiters and gangsters and blackmailers and murderers, and always stayed one step ahead. Until now. Last night, one of the bad guys caught up. Last night, someone followed Sammy up the fire escape and pushed her from the third story. Now she’s in the hospital, out cold. And her friends are left with the questions Sammy’s always been so good at answering: Why? How? But most of all…WHO? In this emotional conclusion to her beloved long-running series, Wendelin Van Draanen shows just how many lives one nosy girl can touch and pays tribute to a life well sleuthed. In Road Rash, when 17-year-old Zach Ryan gets picked as the new drummer in a popular local band going on a long summer tour, he quickly learns about the challenges that come with life on the road. Playing in small venues, Bad Habit deals with a bar brawl and a manager who won't pay them, but the biggest problems come from within the band. Zach is a sympathetic "nice guy" narrator who is trying to be a responsible band member, despite being its newest and youngest addition. He's also good at expressing the thrill of creating music. Places in the signing line are reserved for those who purchase a copy of one of the featured books from The King's English. Authors Wendelin Van Draanen and Mark Huntley Parsons stop by Arcadia on their "He Said, She Said" book tour to discuss Sammy Keyes and the Kiss Goodbye and Road Rash - both terrific books for young adults. Interested in knowing more about how the publishing industry works? Want a bit of inspiration from a pair of Random House authors who have juggled “Real Life” with the “Writing Life” for many years? Join us Tuesday, October 7, at 7:00 pm. Discussion will address the writing process, dealing with agents, editors and publishers and the book-to-movie experience. Van Draanen is the author of over 30 books including Sammy Keyes mysteries, The Running Dream and Flipped, while Parsons is new to the YA genre with his debut book, Road Rash. Additionally, they both share the same publisher—Knopf/Random House. And share the same office. And… the same life. Because Mark and Wendelin are married. And have been, for even longer than they’ve been writing. Books featured on the California couple’s “He Said, She Said” tour will include Van Draanen’s best-selling Sammy Keyes mystery series, as well as a selection of her popular stand-alone novels including The Running Dream and Flipped. Parsons will discuss and sign Road Rash, his new band-on-the-road YA adventure. Have you watched the movie Flipped? Have you read the Sammy Keyes series? Do you like mysteries? Are you a drummer? Do you work with your partner and want to strangle them? If you said yes to any of these questions, then you must come and hear Wendelin van Draanen, the author of over 30 novels for young readers, with the next installment of her Edgar Allan Poe Award-winning Sammy Keyes mystery series. Joining her is her husband, Mark Huntley Parsons, with his debut novel about a teenage drummer who finds out what life is really like on tour with a rock band. This writing couple will discuss their books, the writing process, and how they've managed to share the same office for 20 years without bloodshed! It's going to be a blast! Bookworks premiers a new Sammy Keyes mystery book club with teh first of the series, Sammy Keyes and the Hotel Thief, by Wendelin Van Draanen. Free and opepn to the public. More info: kids@bkwrks.com. Book club purchases receive 10% off. It’s the “He Said, She Said” Author Road Show featuring... Wendelin Van Draanen and Mark Huntley Parsons See the trailer for Road Rash here. MARK PARSONS has been a drummer since 7th grade when he saved $100 from his paper route to buy a used drumset, and he's been pounding away ever since. He's a long-standing contributor for Modern Drummer magazine, and has written non-fiction books on audio and music-related topics. Books have always been a part of Wendelin Van Draanen's life. Her first book was published in 1997, and since then her titles have won many awards. Now in its sixteenth installment, the Sammy Keyes Mysteries have been nominated for the Edgar Allan Poe Award for Best Children’s Mystery five times, with Sammy Keyes and the Hotel Thief bringing home the statue. Additionally, she has won the Christopher medal for Shredderman: Secret identity, the California Young Reader Medal for Flipped, and the Schneider Family Book Award for The Running Dream. Her books have been translated into many foreign languages, Shredderman became a Nickelodeon made-for-TV movie, and Flipped was released as a feature film, directed by Rob Reiner. She lives in California with her husband and two sons. Her hobbies include the “Three R’s”: Reading, Running and Rock ’n’ Roll. Copies of the authors' books will be available for purchase and signing at the event. If you would like a signed copy but cannot attend the event just let us know! on the He Said, She Said Tour! Husband and wife Young Adult author team Wendelen Van Draanen and Mark Parsons are hitting the road and we're happy to announce they're making a stop at BookPeople! Wendelin will talk to us about her latest book, Sammy Keyes and the Killer Cruise. Mark Parsons will share his new novel, Road Rash. It's going to be a blast! Join us for the fun! Wendelin Van Draanen has written more than thirty novels for young readers and teens. She is the author of the long running Edgar-winning Sammy Keyes series, and two four-book series for younger readers (Shredderman and The Gecko & Sticky). Additionally she has written several stand-alone novels, including The Running Dream, Swear to Howdy, and Flipped (named a Top 100 Children’s Novel for the 21st Century by SLJ and became a Warner Brothers feature film). Mark Parsons has published primarily non-fiction, penning over a hundred articles for national magazines as well as a pair of non-fiction books. His debut novel, Road Rash, is a YA adventure about a high school boy who goes on the road with a band. It draws from Parsons’s many years of experience as a rock drummer. This writing couple from California will discuss their books, the writing process, and how they’ve managed to share the same office for twenty years without bloodshed. Wendelin was a classroom teacher for many years, Mark an instructor at a Fortune 500 company. They have two sons, two dogs, and two wild imaginations. 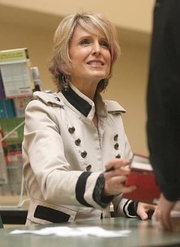 In order to have anything signed at a BookPeople event, a copy of the event book must be purchased from BookPeople. If you purchase your book from BookPeople in advance of the event, please save your receipt and present it at the event. Thank you for supporting Wendelin Van Draanen, Mark Parsons & your local independent bookstore! Wendelin Van Draanen is currently considered a "single author." If one or more works are by a distinct, homonymous authors, go ahead and split the author. Wendelin Van Draanen is composed of 26 names. You can examine and separate out names.